There will always be top-shelf smartphones that spare no expense when it comes to design, features, and raw performance. And you're always going to be able to find bargain-basement hardware that may feel awkward and outdated, but gets the job done for a fraction of what those flagships cost. But it's right in the middle where things really get interesting, as manufacturers try to strike a careful balance that aims to still feel premium while also giving us a heck of a strong value for our money. Last summer, Huawei's Honor sub-brand introduced its latest affordable flagship in the form of the Honor 8. It had a really attractive design, with dual flush-mounted rear cameras and a glass-covered etched back that caught the light in fascinating ways. 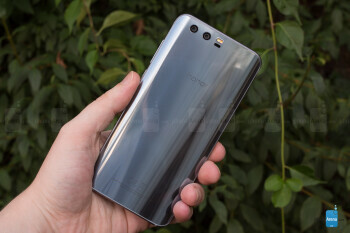 We were quite impressed with what Honor managed to put together at the time, and the biggest thing that stopped us from being even more enthusiastic about the handset was that it faced some really steep premium-mid-range competition. This year, Honor's back with its follow-up, the Honor 9. 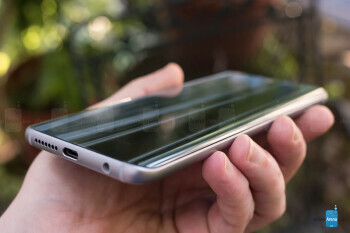 The _phone_ sure looks a lot like last year's model; can we expect more of the same from the experience it offers, or has Honor managed to pick up some new tricks since the last time we crossed paths with this series? Let's take a look. While the Honor 8 represented a pretty big design departure from the Honor 7, this year the manufacturer isn't looking to reinvent the wheel, and the Honor 9 is easily recognizable as an Honor 8 successor. 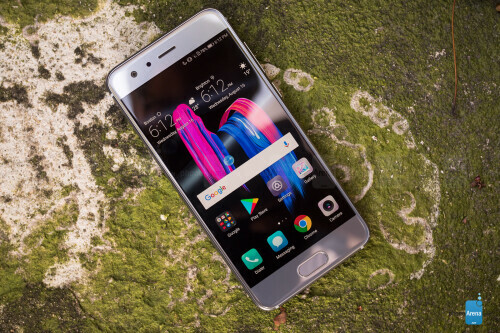 It's got a similar layout, with the most pronounced resemblance occurring around back, where the _phone_ shows off the same sort of dual-camera setup as last year, as well as that same glass-topped metal-ridged design. But not everything is a straight-up rehash, and there are a few elements here that clearly differentiate the Honor 9 from its predecessor. 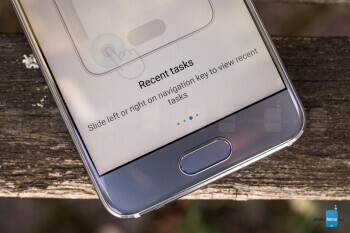 Most prominent of those is probably the repositioning of the phone's fingerprint scanner, from top-center on the phone's back to right underneath the handset's screen. Whether or not that's an improvement is going to depend a lot on your personal usage preferences, but functionally it's still an incredibly fast, largely accurate scanner. 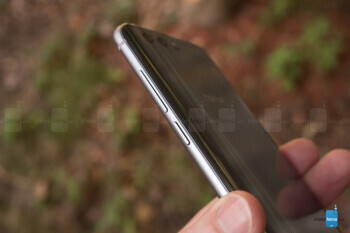 Another, slightly less prominent change concerns the phone's edges. Now, the Honor 8 already featured curved edges, with a graceful metal arc helping to transition from front display to rear glass. That basic construction returns for the Honor 9, but this time around the back-panel glass has a bit of a more gradual curve to its sides, looking almost Samsung-like in its construction. That change still feels pretty good in the hand, but we miss the symmetry that last year's model enjoyed – here it's hard to ignore that the shape of the phone's front doesn't match its back. The idea of making phones into a glass-and-metal sandwich is far from a new one, but sometimes we see companies struggle with the implementation – and here, the Honor 9 falls victim to the same sort of issue we had with this construction on the HTC U11. 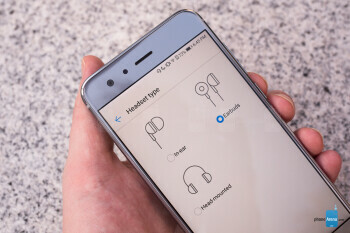 If you match those parts up well, your phone's going to be in great shape, but it can be tricky to get metal and glass components to always align perfectly, and with the Honor 9, we can feel some pronounced ridges where these disparate parts come together – it's not unlike the experience you get running your finger over the edge of a screen protector. On a mid-ranger like this, it's a more palatable misstep than it would be on a more expensive phone, but it still manages to feel a little short of the premium aesthetic that Honor is clearly going for. Finally, all these design decisions contribute to a situation that leaves the Honor 9 with a bit of an unfortunate characterization: the phone is super, impossibly slippy. We kept placing the phone on seemingly flat tables (those on which every other phone remained perfectly still) only for it to slowly, slowly, slide off and careen down to the floor. We can't say if any one design element is more to blame than others, but between the perfectly flush cameras, the moving of the fingerprint scanner around front, and the reconfigured curved back edges, the Honor 9's glass back is just way too slick for its own good. We're used to needing to be careful with our phones, but this one feels way more damage-prone than we're comfortable with. At least, its glass back means it'll be harder for it to slip out of your hand, compared to a phone with back made of metal. In a world where it feels like everyone's pushing us towards phones with larger and larger screens, Honor's taking an unexpected (but absolutely very appreciated) step back this year with the Honor 9, giving the phone a comparatively petite 5.15-inch display. The screen's 1080 x 1920 resolution won't set any pixel-density records, but feels quite appropriate for a panel this size; anything much higher would go wasted. Brightness is really solid, with the Honor 9 emerging with one of the brightest screens we've seen on a phone all year – and that does a lot to keep the phone feeling flexible, and easy to use in all variety of environments. Color accuracy is kind of middle-of-the-road, with both some minor saturation and hue issues, but the overall picture isn't too objectionable. 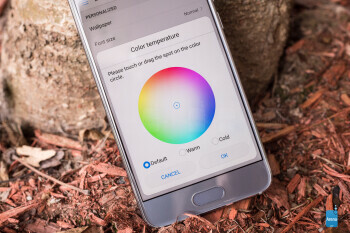 And thanks to the phone's EMUI software, color temperature is easily customizable over a wide range, helping you tailor screen output to your preferences. This year, Honor's back with its follow-up, the Honor 9. 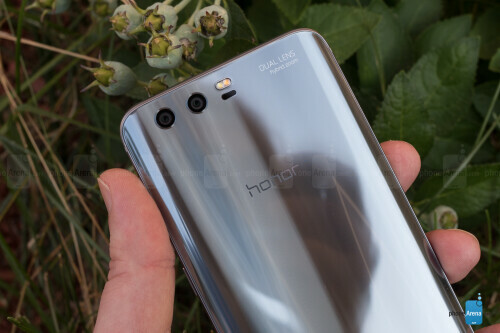 The phone sure looks a lot like last year's model; can we expect more of the same from the experience it offers, or has Honor managed to pick up some new tricks since the last time we crossed paths with this series? Let's take a look. While the Honor 8 represented a pretty big design departure from the Honor 7, this year the manufacturer isn't looking to reinvent the wheel, and the Honor 9 is easily recognizable as an Honor 8 successor. It's got a similar layout, with the most pronounced resemblance occurring around back, where the phone shows off the same sort of dual-camera setup as last year, as well as that same glass-topped metal-ridged design. 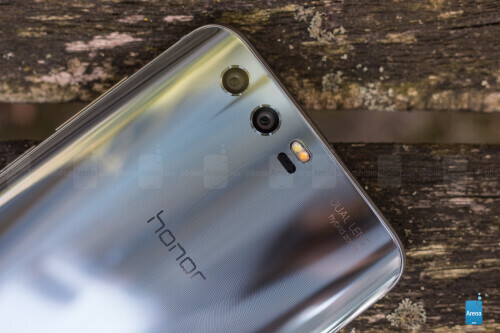 Huawei's EMUI is software we're quite familiar with by this point, and the EMUI 5.1 present on the Honor 9 is the same version we've checked out on recent Huawei phones like the P10 series. As such, there's little in the way of surprises here. In the Honor 9's favor, the theming engine here uses more of a light touch, and we're seeing less of the objectionably monochromatic icon packs that were all over the P10 phones. 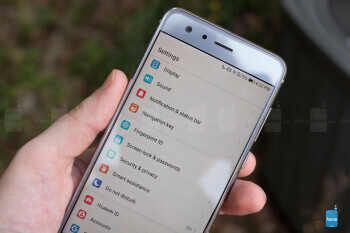 But while the Honor 9 as we reviewed it isn't tied to any carrier partner, there's still a fair amount of bloat here in the form of pre-installed third-party apps and games. One nice extra is the return of the infrared emitter for controlling home-entertainment devices. That was absent on the smaller P10, so getting it on an affordably-priced model like this is a special treat. 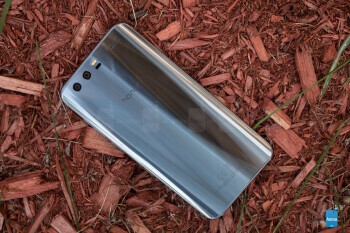 While most phone-makers are content to just toss the latest (or maybe even a generation or two old) Snapdragon chip at their latest phone, Huawei (and as it follows, Honor) likes to do things a little differently, and much like Samsung or Apple, prefers to deliver hardware featuring its own chips. To that end, the Honor 9 is running the company's own Kirin 960, a chip we got to know last fall on the Huawei Mate 9, and have seen since on phones like the P10. So while the Honor 9's processor is hardly the latest-and-greatest, it's still a decently powerful chip. To put it in perspective for you Snapdragon fans out there, expect performance that's a little better than the 821 (on phones like the HTC U Ultra or LG G6) but still south of the 835 powering the most capable flagships out there. That's all helped out by the presence of a more-than-adequate 6GB of RAM (4GB is also an option). Is all that memory going to go to good use on a daily basis? Almost certainly not, but its presence still speaks to the efforts made here to ensure that the Honor 9 can stand on solid ground compared to the rest of this season's heavyweights. It may not be able to touch the very best-equipped juggernauts, but it's not about to make an embarrassment out of itself, either. Right now, the big issue with Honor 9 connectivity is its band support. Currently, Honor's not focusing on US sales of the phone, so support for American cellular networks can be a bit spotty. We went out to test the Honor 9 with a T-Mobile SIM, and the best we could manage was an EDGE connection – which, as anyone who's been using smartphones for years can attest to, is not an era you should be eager to revisit. Users in Europe and other areas where the Honor 9 is being made commercially available are likely to face fewer issues along these lines, but if you're concerned with having anything remotely resembling usable data speeds, be sure that you double-check that your carrier's stack of mobile bands are adequately supported by this hardware before picking it up. Huawei (and correspondingly, Honor) has been on a big dual-camera kick lately, and that's not changing any for the Honor 9. Like the Honor 8, the phone's equipped with a pair of sensors, set tastefully flush and tucked away up in the corner of the handset's back. On the surface, things look a lot like they did on the Honor 8 – the only indication anything's changed at all is a 90-degree rotation to the camera's flash and laser-focus sensor. 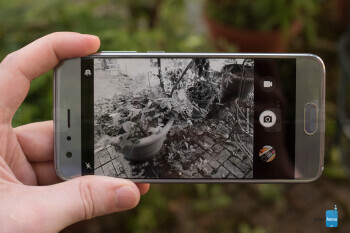 But whereas the Honor 8 featured a pair of 12MP cameras – one full-color, one monochrome – the Honor 9 instead bumps the resolution of that black-and-white camera to 20MP, while keeping the color at 12MP. That's similar to the sort of arrangement we've seen from 2017 Huawei phones like the P10 and P10 Plus – absent any fancy Leica branding. To little surprise, the camera setup on the Honor 9 performs much in the same league as the cameras on the Huawei P10 and P10 Plus. That means some strong low-light performance, as well as decent-looking shots in more favorable environments. Once again, the software is packed with features, but the implementation could use a little work. 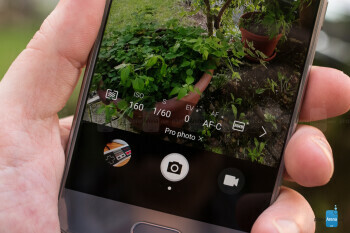 Most everything's tucked away on a separate page of the camera's interface, which users must swipe to access; for common things like HDR or B&W mode, it might have been more successful to place more easily reachable toggles right on the main screen. The camera does support a hardware “zoom” mode, letting you switch between 1x and 2x views, but it comes at a cost. You can choose to shoot pics at the full 20MP resolution of the monochrome camera and interpolate-up the 12MP color data – this makes sense to do, since the human eye is far more sensitive to brightness changes than shifts in color – but the zoom mode is only available when taking shots at native 12MP and below. The front 8MP selife cam's not bad itself – again, even in low-light environments – but the phone pushes a little too hard on the software-enhancement side here. The blurred-background bokeh mode has worse edge-detection than most, and we're still not quite sold on the idea of “beauty” filters in the first place. Recording video with the Honor 9 is a mix of success and failures. On the plus side, the phone's microphones work great, easily capturing audio even in noisy environments, and refocus times are fast. But on the flip side of that latter point, the camera's often a little too aggressive when hunting for something to focus on, and we often found it losing focus during pans. Electronic stabilization works decently, but like so many other phones, its functionality is limited – here to shooting at 1080p (30fps) or lower. The Honor 9 pumps its audio out through a single bottom-edge-mounted speaker. The quality's not bad, and the volume's there when you need it, but we noticed a bit more of a going-through-a-tunnel-sounding reverb than we'd like to hear. That effect is most pronounced at higher volume levels. 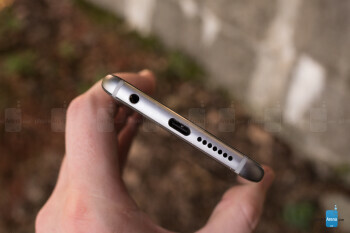 However, it's not really the speakers being emphasized here, so much as the headphone experience: something being called Huawei Histen. Yes, Histen with an H – that's not a typo. The mode toggles on when you plug in a pair of headphones, and promises virtual 3D surround sound. While it definitely expands the soundscape of what you're listening to, there's an inescapable fake-ness to how it sounds – and we definitely prefer turning the surround sound mode off. Luckily, there's a standard Histen mode that offers a basic EQ and output tailored to specific headset types – and this one's much more successful. Our earlier comments on possible band issues with North American cellular networks still stand so far as data is concerned, but none of that should have much of an impact on voice-call service. And indeed, we ran into no issues placing nor receiving calls with the Honor 9. Voice quality sounded fine, but as we so often note, a phone really has to go out of its way to mess that up these days. Just rest assured that the Honor 9 doesn't have anything to worry about in that department. This year, Honor's giving its affordable flagship a battery boost, replacing the 3,000mAh battery from the Honor 8 with a slightly larger 3,200mAh component. The phone doesn't waste that power, either, and in our custom tests, we managed to squeeze out just over eight hours of screen-on time from the handset. While that's no record, it does compare favorably to big-name phones like the Galaxy S8 and LG G6, and even comes neck-and-neck with the Huawei P10 Plus and its 3,750mAh battery (though, of course, that one's also packing a larger, power-hungry screen). 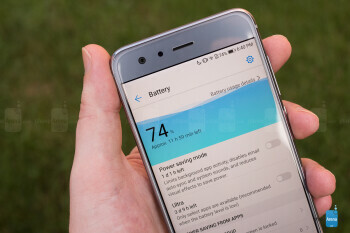 Just as the Honor 9 holds its own against pricier phones in terms of battery endurance, it also puts on a comparable showing when it comes to recharging the phone, and the included charger (with the necessary adapter to use the euro-style plug in US outlets) refueled the handset in just north of 100 minutes. And if you don't have that long to wait, you can get the battery up to 50 percent in only around 45 minutes. 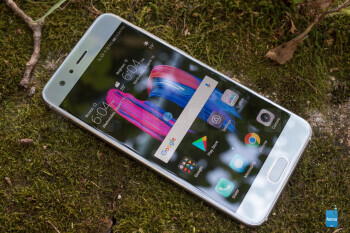 The only real negative here is that while the Honor 9 is being positioned as an alternative to expensive flagship devices, its pricing is much more in the mid-range space, and here shoppers may be used to phones that aren't just capable of good battery life, but utterly insane longer-than-day-long battery life – and that's due in no small part to the power-sipping nature of Qualcomm's mid-range Snapdragon 625 chip. Compared to those devices, the Honor 9's at a disadvantage, but perhaps its speedy performance will help compensate for any endurance shortcomings. In almost every aspect, the Honor 9 is a substantial upgrade over the Honor 8. And maybe even more impressive is how favorably it compares to the Huawei P10 and P10 Plus – both much more expensive phones. Just how much you'll shell out for the Honor 9 varies by market, but we're often seeing it for between 380 and 430 EUR. Doing a direct-to-dollars comparison won't make a lot of sense based on how smartphones are often sold, but anywhere from $350 to $500 (though probably not quite that high) would be believable if Honor ever decides to bring the Honor 9 to the States. The Honor 9 does a whole lot well, and that's all the more of an accomplishment considering the handset's sub-flagship pricing. The design, while not departing very far from that of its predecessor, still works well, and even in an age of super-widescreen 18:9 displays, a traditionally-shaped phone like this can still look and feel good when we're talking about a model this compact. There are still weak points, and we really don't love how easy it is for this phone to accidentally slide off a desk – it's just way too slippy, and much as we docked the Moto Z2 Force because its easy-to-scratch screen had us feeling paranoid about damaging the phone, so too does the feeling that the Honor 9 is one slide away from breaking detract from the ownership experience it presents. To be fair, the phone does come with an included case, but we hate having to use any case if we don't have to. We're not going to get too hung up on our problem with data bands, as this phone isn't yet targeted at US networks, but we do wish there were anything along the lines of waterproofing present here – that's increasingly something we take for granted when shopping for new phones.